Horse trail riding in Idaho with family-owned Deadwood Outfitters is the ultimate horseback riding experience you won't want to miss. Ride well-trained mountain horses on our guided trail rides along beautiful streams, in open meadows or to high mountain lakes. 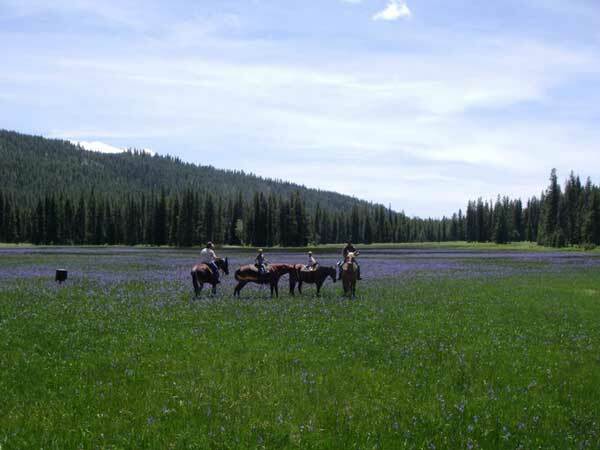 Idaho horseback riding in the backcountry is the ideal way to have fun, and enjoy the spectacular nature around you just the way the cowboys did. 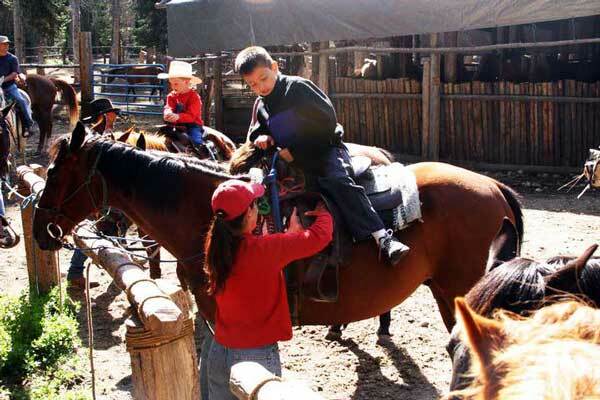 Choose extended or overnight horseback trips, or ride short distances from camp each day. 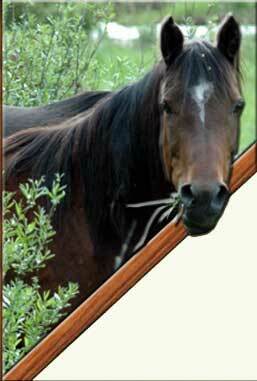 Our quality horses accommodate every level of rider from the beginner to the wrangler. Our friendly trail guides are happy to answer any questions you may have on the history, wildlife, or points of interest along the way. Our trail guides will lead you on gentle trail rides through open meadows, into the hills, along sparkling rivers. This is a wonderful horseback ride for riders of all abiities and a great way to capture Idaho's backcountry spectacular scenery with your camera! Return to the lodge for a prepared lunch or hamburgers and snacks for a nominal fee. Spend a half day horseback riding up the mountain, down along the river or through glorious meadows. We will plan your ride according to riders abilities and preferences. 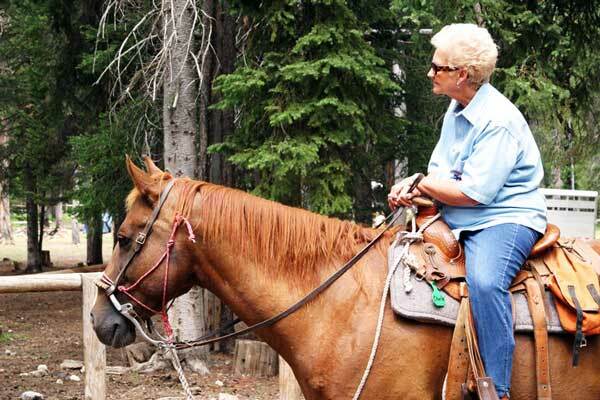 Spend a full day on horseback to soak in the splendor of the untouched Idaho backcountry. 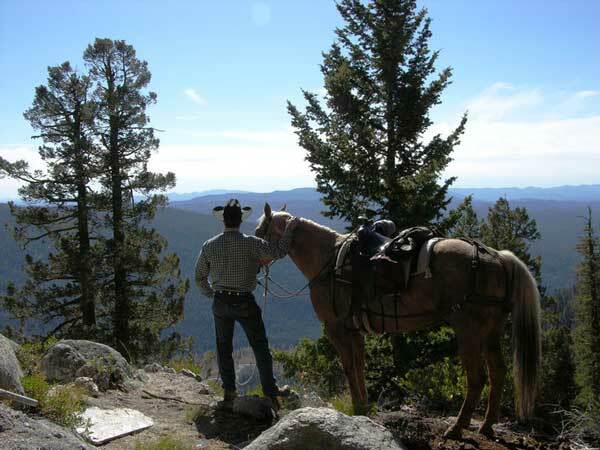 Full Day Horseback rides include riding to Rice Peak, an abandoned fire look out, a great place to explore and the highest point in the surrounding area; and BEAUTIFUL trails into the Frank Church River of No Return Wilderness. Join Deadwood Outfitters for a day of horseback riding or choose any of our Idaho Vacation Packages for extended stays with us. 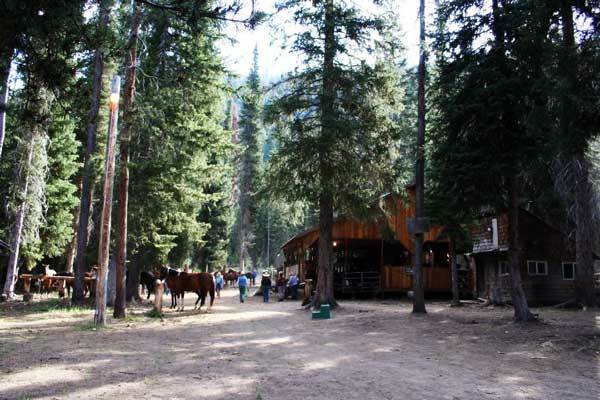 Idaho Family Adventures - Accommodations at our base camp on the beautiful Deadwood River include nights in rustic cabins, wholesome, hearty meals tastefully prepared. 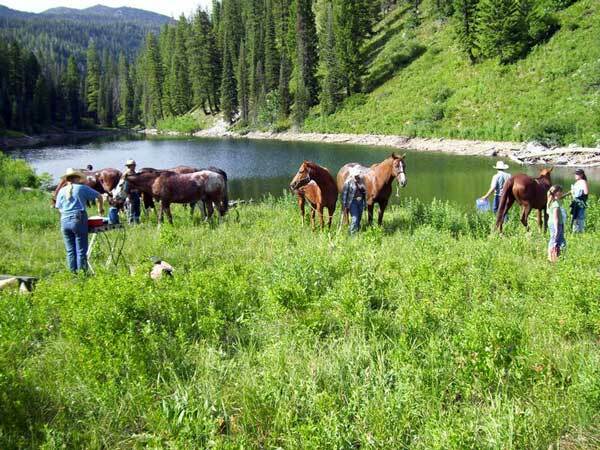 Ride well-trained mountain horses along beautiful streams or to high mountain lakes. 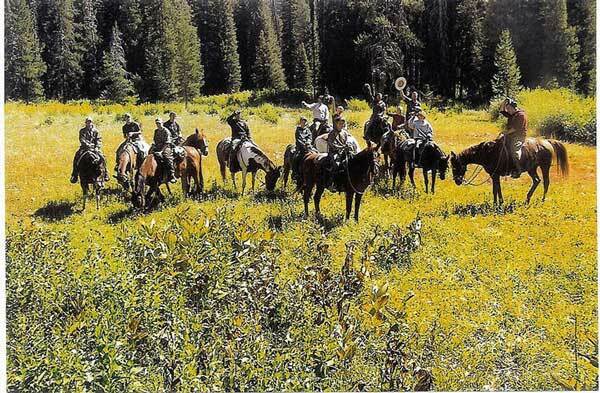 Choose extended or even an overnight horseback trip, or ride short distances from camp each day. 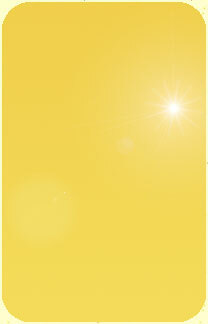 You may choose to relax, fish, hike, photograph or practice your artistic talents. $210/Day + tax. Call for a special group and children's rates that may apply. We can accommodate groups up to 30. Idaho Guided Pack Trips - This is camping like you have never experienced in areas rarely visited by outsiders, an experience never to be forgotten. A time to indulge your fishing fancy in beautiful high mountain lakes and streams - or a chance to photograph or video the scenery and wildlife of Backcountry Idaho - perhaps just a time to relax and "get away" - have a comfortable camp set up for you - enjoy excellent dutch oven cooking. An Idaho guided pack trip experience of a lifetime. $360/Person/Day + tax. Idaho Photography Trips - Deadwood Outfitters is a photographer's dream location, with abundant wildlife, wildflowers, open meadows, mountains, beautiful horses right at our wilderness lodge. Customized photography tours for your group and friends. You won't want to miss Deadwood Outfitters Annual Photography Clinic. 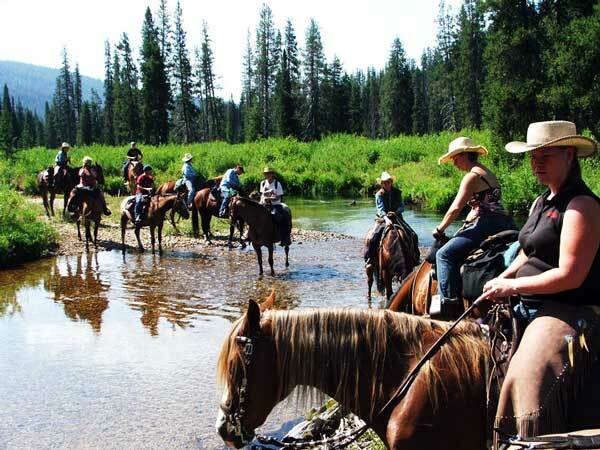 Idaho Saddle & Paddle - Horseback Riding & River Rafting - Deadwood Outfitters have partnered with Cascade Raft Company to offer a combined trip of River Rafting with Cascade Raft Co and horseback riding with us.